Inflammatory Myofibroblastic Tumor; Appendix; Appendicitis. Inflammatory myofibroblastic tumor (IMT) is reported virtually in every anatomic location of the body, but most cases are commonly identified in the mesentery and omentum. The etiology of this tumor is unclear with many suggestions of viral, inflammatory, or oncogenic mutational factors that establish it as a clonal neoplasm. Clinical and laboratory workup, including roentgenography, is not usually helpful to reach a pre- or intraoperative diagnosis. Histopathology and immunohistochemistry of the resected specimen provides a definitive answer by the exclusion of a close clinical differential diagnosis of gastrointestinal stromal tumor and many lookalikes. Complete surgical excision with clear margins is the mainstay of treatment. Rare cases have been seen involving the appendix. To the best of our knowledge, only 11 confirmed cases of purely appendiceal IMT have been published in the literature to date. We are reporting an unusual case of appendiceal IMT in a 14-year-old boy who presented with symptoms and signs of acute appendicitis. A review of the literature and comparison with other similar published cases is also included. 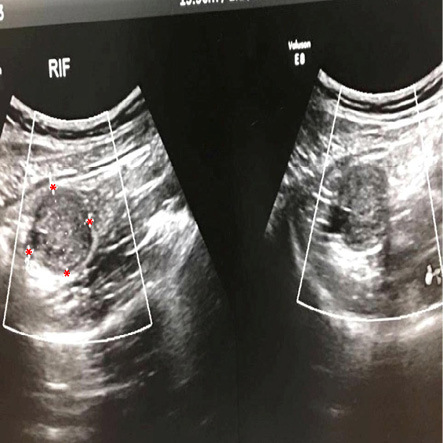 A 14-year-old boy was referred to the emergency room with acute abdomen with right-sided iliac fossa pain and tenderness and fluctuating nausea and vomiting for two days. On physical examination, the rebound tenderness sign was not significantly positive. Ultrasonographic examination showed a mildly echogenic oval-shaped area measuring 31 × 26 mm in the right iliac fossa and a connection with an attached hypoechoic tubular structure. This was reported as mucocele of the appendix [Figure 1]. Contrast-enhanced computed tomography scan was suggested to enable further evaluation. However, the surgeon preferred to proceed with surgery based on a strong clinical preoperative diagnosis of acute appendicitis. Figure 1: Mildly echogenic oval-shaped lesion measuring 31 × 26 mm (asterisks) noted in the right iliac fossa. The lesion also connected to a hypoechoic tubular structure (the appendix). An emergency laparotomy was performed during which the surgeon found a firm to solid-looking mass encircling the tip and firmly adherent to the appendiceal wall. This was difficult to excise intact with healthy surgical resection margins. This intraoperative scenario gave the impression of sarcoma or an appendicular tumor. Microscopic examination showed histological features of a mesenchymal neoplasm composed of loosely arranged plump to spindle-shaped myofibroblastic cells in an edematous myxoid background with proliferating blood vessels and an infiltrate of plasma cells, lymphocytes, and eosinophils [Figure 2]. The features were suggestive of a low malignant potential/borderline gastrointestinal stromal tumor (GIST) or a low-grade fibrohistiocytic neoplasm. The presence of neutrophils within the muscularis propria of the appendiceal wall was evidence of acute appendicitis. 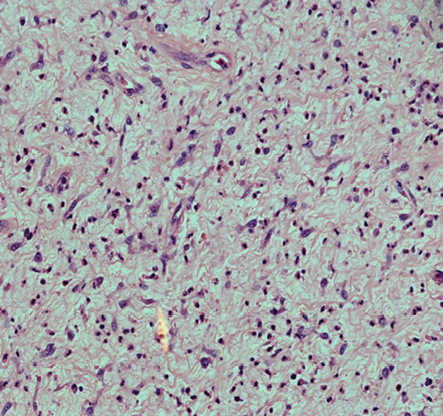 Figure 2: Inflammatory myofibroblastic tumor of the appendix showing a neoplasm composed of numerous plump to spindle-shaped myofibroblastic cells in a background of myxoid tissue with proliferating blood vessels. Note the presence of numerous inflammatory cells. Hematoxylin and eosin staining, magnification = 200 ×. A panel of immunohistochemical stains were performed. The tumor cells were focally positive for desmin [Figure 3] and negative for CD117, CD34, DOG-1, and activin receptor-like kinase (ALK-1) protein. Based on the immunohistochemistry and morphological features a final diagnosis of IMT was confirmed with the exclusion of GIST and mucinous neoplasms of the appendix. The patient’s postoperative course was uneventful. 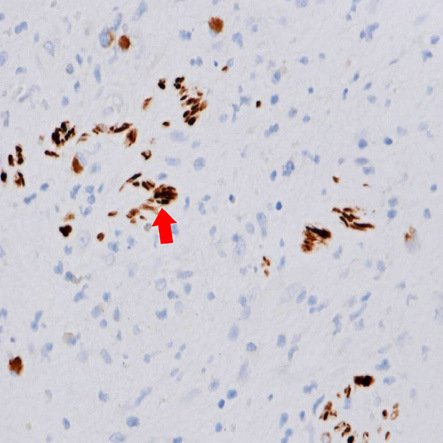 Figure 3: Immunohistochemical stain for desmin showing scattered intratumoral positive cells (arrowhead), magnification = 400 ×. The appendix is a very rare site for IMT and this is one of the reasons for writing this case report. To the best of our knowledge, only 11 cases of appendiceal IMT have been reported excluding one recent report, which had a preceding event of gastric cancer treatment.4 The last case was reported in 2012 and was associated with a rare finding of mucosal dysplasia.5–7 Extrapulmonary IMTs show a tendency for occurring in children, with a mean age of approximately 10 years. Females are affected slightly more commonly than males.3 However, the gender in almost all reported cases of appendiceal IMT is male. Bonnet et al,8 reviewed 74 abdominal cases of IMTs in children. They found only a single case with appendiceal origin which was the first reported case by Narasimharao et al.9 The patient was an 8-year-old boy who presented with symptoms of appendicitis. The last and eleventh case was reported in 2012 but with a very rare finding of dysplasia in addition to appendiceal IMT, which had not been observed in any previously described cases.7 In our case, laboratory findings showed significantly increased neutrophils, which is consistent with a finding of leukocytosis. This was also highlighted in a case reported by Oeconomopoulou et al,2 in 2016. In our case, clinical and preoperative impression of acute appendicitis were somewhat confused and changed to an appendiceal tumor during intraoperative analysis. Immunohistochemistry plays an important role in better defining the lesion with the presence of positive vimentin, smooth muscle actin, muscle-specific actin, desmin, and focally for cytokeratins in the majority of cases. Overexpression of ALK-1 protein is seen in 50–60% of IMTs, which is considered significant if positive but in our case was negative.1 This immunophenotypic feature is associated with a local recurrence rate of 15–37% in a large series of children.1,4 Another panel of immunohistochemical markers including CD117, S-100, CD34, and DOG-1 was performed to exclude other spindle cell neoplasms with GIST as a primary suspect. Hence, the final pathological diagnosis was IMT. Appendiceal IMT is a rare mesenchymal neoplasm of intermediate biological potential, which may occur alone or coexist with acute appendicitis. Although radiology is not characteristic of these lesions, it can be an adjunct to pre- or intraoperative differential diagnosis. The final diagnosis should be based on histopathological and immunohistochemical findings. Complete surgical excision of appendiceal IMT remains the mainstay of treatment. A careful one-year follow-up is recommended because of the risk of local recurrences. The authors would like to express their gratitude to Ms. Venus Vega Navalta and Ms. Honainah Ishaq Tahir for their excellent secretarial and organizational skills during the typing of this manuscript. 1. Coffin CM, Watterson J, Priest JR, Dehner LP. Extrapulmonary inflammatory myofibroblastic tumor (inflammatory pseudotumor). A clinicopathologic and immunohistochemical study of 84 cases. Am J Surg Pathol 1995 Aug;19(8):859-872. 2. Oeconomopoulou A, de Verney Y, Kanavaki K, Stefanaki K, Pavlakis K, Salakos C. Inflammatory myofibroblastic tumor of the small intestine mimicking acute appendicitis: a case report and review of the literature. J Med Case Rep 2016 Apr;10:100. 3. World Health Organization. WHO Classification of Tumours of Soft Tissue and Bone IARC WHO Classification of Tumours, 3rd ed. Lyons, France: World Health Organization; 2013. 4. Coffin CM, Hornick JL, Fletcher CD. Inflammatory myofibroblastic tumor: comparison of clinicopathologic, histologic, and immunohistochemical features including ALK expression in atypical and aggressive cases. Am J Surg Pathol 2007 Apr;31(4):509-520. 5. Oh E, Ro JY, Gardner JM, Kim JW, Jung WH, Yoon SO. Inflammatory myofibroblastic tumor of the appendix arising after treatment of gastric cancer: a case report and review of the literature. APMIS 2014 Jul;122(7):657-659. 6. Uludag M, Citgez B, Polat N. Inflammatory pseudo-tumour of the appendix and acute appendicitis: a case report. Acta Chir Belg 2008 Jul-Aug;108(4):451-453. 7. Majumdar K, Sakhuja P, Kaur S, Rastogi A, Gondal R, Agarwal A. Inflammatory myofibroblastic tumor appendix with concomitant mucosal dysplasia, simulating pseudomyxoma on preoperative aspiration cytology. J Cancer Res Ther 2012 Apr-Jun;8(2):317-319. 8. Bonnet JP, Basset T, Dijoux D. Abdominal inflammatory myofibroblastic tumors in children: report of an appendiceal case and review of the literature. J Pediatr Surg 1996 Sep;31(9):1311-1314. 9. Narasimharao KL, Malik AK, Mitra SK, Pathak IC. Inflammatory pseudotumor of the appendix. Am J Gastroenterol 1984 Jan;79(1):32-34. 10. Vijayaraghavan R, Chandrashekar R, Belagavi CS. Inflammatory myofibroblastic tumour of appendix. J Clin Pathol 2006 Sep;59(9):999-1000.